If Optimus Prime is a blockbuster movie, Seaspray is the obscure Argentinian shoe lace making documentary that Mark Kermode tries to convince you is more worthy of your time. Weird, non militarised, carrying a weight problem and fond of romancing the occasional “Tlalakan” he’s something of an oddity amongst a line of robots focused on war. Seaspray occupies a different space in Transformers for me, he’s just wonderfully at odds with so much of the Transformers mythos. So I was easily swayed into buying my first ever Toyworld figure when they released Wavebreak, their take on the first Masterpiece style version of the character. Exciting eh? Maybe not, but continue after the jump to see the full article. Seaspray was (as far as I can tell) the only pre movie Transformer with an aquatic based alt mode and took on the form of a hovercraft. In a world of jets, tanks, sports cars and trucks it’s a fairly bold form to take. I feel confident in saying that Seaspray was the only pre season 3 Transformers figure that chose water as their specialist subject. Right there, any illusions that this guy was built for battle should be dispelled as even the farcically impotent cartoon lasers of the 80’s should have no trouble piercing his poxy air cushion. Wavebreak nicely captures the spirit of the Seaspray character, right down to the front of the vehicle mode looking like a bemused Ninja Turtle face. 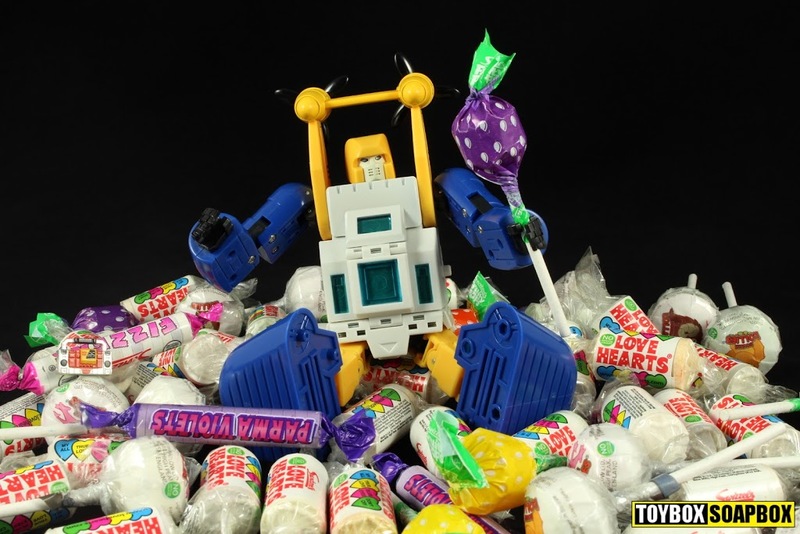 The vibrant blue, yellow and white colour combo is retained with Toyworld resisting the temptation to craft a real world inspired vehicle mode and sticking with the chibi styled original minibot look. It’s small, squished, nostalgic, fun and all the better for it. It has widely become accepted over time that Masterpiece is a combo of toon accurate bot mode and real world vehicle. Anything outside those margins is heresy in some quarters but to me this is perfect. It’s fun and Liams just wanna have fun. That’s all they really want. No wheels are included so Wavebreak doesn’t roll, and I was tempted to see if he could float in water but there’s currently a giant spider sat in my bath. Plenty of gaps pepper the underside of Wavebreak for water to seep through, so I suspect he’d be swallowed beneath the Matey bubble bath and sink to a watery demise. Clear, tinted blue plastic windows help Wavebreak look like he is already full of water. Perhaps Toyworld were gunning for the idea of a party hovercraft – with a pool inside? Floating across the ocean to the sounds of Aswad blaring out of Blaster. As a disciple of the church of M.A.S.K, my heart glows at the sight of Toyworld equipping Wavebreak with flip out laser cannons. Features like this were such an intrinsic part of the Transformers cartoon and helped accentuate that despite looking like earthen vehicles they were still alien robots at heart. It was always neat way to bring that through and add something unique to each character. To access Wavebreak’s cannons, you pull up the roof panels and flip the gun barrels out. Weirdly they only point upwards but remember, Decepticons are pretty much always whizzing about in the sky so he’d only be shooting upwards anyway. As far as vehicle modes go Wavebreak’s doesn’t do a lot but it doesn’t have to. Guns pop out, the propellers spin and really that’s all it needs. Most importantly there’s an intrinsic sense of fun that Seaspray possesses and Toyworld have managed to capture that. Moving Wavebreak from hovercraft to robot is a pleasantly straightforward process. As with the original, the front of the vehicle pulls forward, splits and the halves flip up to form giant feet. The legs unfurl from inside the torso and the roof panels take their place inside the body. Annoyingly, they have to slightly bend over a lip of plastic and whilst it doesn’t feel like it’s going to break it’s still an entirely avoidable, trivial annoyance. At it’s core it’s the basic G1 toy’s transformation with a couple of flourishes befitting a more modern and complex figure. Basically it’s dead easy and I love it. Why do I like Seaspray much? Because in the cartoon he looks like a chubby bloke in a one piece swimming costume wearing inflatable shoes. It’s nuts and full of charm. How can you not love a bot that looks like Jack Duckworth? He’s more at home playing darts in the pub than he is storming a fortress as part of an elite commando unit and it’s there you find the character in him. Most Transformers have a simple, clearly defined personality. Some are soldiers, scientists, engineers, inventors, archaeologists, geologists…they nearly all have a function that quickly and easily defines their character – but Seaspray doesn’t. Beyond being fond of water. He’s a regular bot whose standing up against evil because he thinks it’s wrong. And he’s a straight up weirdo. Seaspray’s vintage toy cut a more svelte figure but 99% of bots are buff – Seaspray is a million more times interesting for not being. Revel in being difference. Where alt mode took inspiration from the vintage toy, the robot mode is heavily influenced by the animation model to produce a fantastic looking Seaspray wanabee. You have the beer belly, there isn’t any hyper detailing and what detail there is largely reflects the animation model but not slavishly – there’s still room for a contentious flourish or two. Toyworld are known for adding their own flavour to things and even when they have a brilliant design they are inclined to something nobody asked for. In this instance the tinted blue, clear plastic windows that formed a sun roof in alt mode now give off the impression that Wavebreaks torso is a fish tank. It’s an odd choice as it robs the figure of some of the mechanical detailing that the original had. In one final act of defiance Toyworld also painted Wavebreaks face white, which has the effect of making his head look like someones bitten into a Solero. A “replacement” plain yellow face is being bundled in with Toyworld’s Arcee, but if I give my thoughts about that particular business practice (all third parties do it) this review will never end. Most of the vibrant colour comes from the bare plastic. Where paint is applied it is mostly reserved for the die cast parts such as the white block under the neck and the yellow propeller section. The white panel on the top of chest being diecast is only to add weight I assume. The yellow on the propellors hasn’t been applied thickly on mine and one side you can see blotches where it’s too thin. Aside from that misstep the QC on Wavebreak is pretty good. The joints are all stiff and the plastic is really thick throughout and that’s impressive because it’s a big figure. There’s no consistency with third party mini bot sizing so just look at the picture above and make of it what you will. So far, Wavebreak is proving to be pretty great but there is one brutal flaw that may make or break the toy for you – a crushing lack of bicep swivel. As it turns out this is a big issue as it heavily restricts what you can do with the arms and posing them becomes an awkward affair. Wavebreak absolutely can not do the Batusi. It’s easy to think this is a fussy complaint, but it should be standard for an Masterpiece style figure at a premium price point like this. If you can look past that, then the rest of the articulation is fine. Ball jointed head,insanely tight wrist swivels, bit of waist rotation and the ankles have so many joints that aid the great balance giant feet in getting some great poses. Letting this article pass by without mentioning the elegant bit of weapon storage would have been a travesty. On the back of the vehicle mode sits an extra blue piece that appears to simply be an extra part of the “air cushion”. Actually it’s Wavebreaks two guns and they don’t have to be removed for transformation. If you don’t wish for Wavebreak to hold any weapons, they can stay in place giving him a hunch back that Disney would be proud of, but they are completely unintrusive. An alternate option is to peg them into two lower peg holes to give the impression he’s carrying an air canister. On the underside of each forearm is a peg hole but I have no idea what purpose they are intended to serve, Perhaps to turn his guns in to skis? Pop them off, extend the barrells and slide them into his hands and he gains dual rifles. Sadly the shape looks odd and there’s virtually no gun detailing to speak of. Man with the golden gun he ain’t. Man dual wielding a sliced cocktail sausage…perhaps. Other than that there are no accessories. We are accustomed to alternate faces and a plethora of bonus, character specific goodies but not here. No love for an Alana minfig, guys? If you are looking for a Masterpiece style Seaspray then you can’t go far wrong with Wavebreak. The quality is excellent, both modes look spot on and you get a reasonable chunk of plastic and metal for your money. It’s not perfect and it does suffer from the Toyworld curse of an obvious and annoying Achilles heel with the lack of bicep swivel (I am not being fussy, I swear), sparse accessories and the fish tank belly is an odd choice by any metric, but these things are easy to forgive for me because Wavebreak conveys so much of Seaspray’s inherent charm. Wavebreak isn’t going to win any awards and is a toy that will fade into memory pretty quickly but Toyworld have delivered me the robot Peter Kaye I wanted…until Takara announce in 2039 when we’re all using jet packs.